Spring is (possibly?!) around the corner! And that means it is March Madness time! Why not create your own bracket and donate to a great cause too? Well here is your chance! 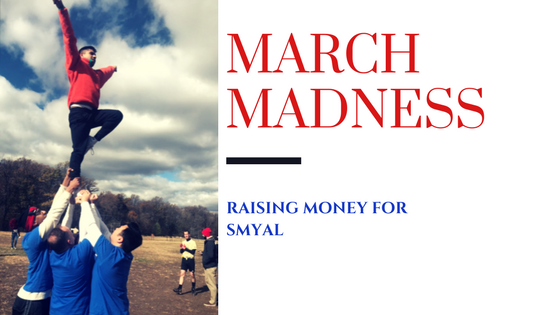 Cheer DC is sponsoring a March Madness tournament to raise money for our primary beneficiary: SMYAL! SMYAL (Supporting and Mentoring Youth Advocates and Leaders) supports and empowers lesbian, gay, bisexual, transgender, and questioning (LGBTQ) youth in the Washington, DC, metropolitan region. Through youth leadership, SMYAL creates opportunities for LGBTQ youth to build self-confidence, develop critical life skills, and engage their peers and community through service and advocacy. Committed to social change, SMYAL builds, sustains, and advocates for programs, policies, and services that LGBTQ youth need as they grow into adulthood. Selection Sunday will be THIS SUNDAY, MARCH 11th and the tournament starts on TUESDAY, MARCH 13th! You only have that short window to actually fill out your bracket, so sign up today!